Verse #8 just seemed right for the happenings of this past week. Hubby is a runner, and my kids and I have stood at countless finish lines. My heart broke when I saw what happened, knowing the place where those bombs went off held families. Truly, no words. In the last forty-eight hours the news has covered Boston. Pictures of unspeakable horror have played and replayed. People have talked about terrorism and the safety of our country. And played more video and pictures. Yes. We need to talk about what happened, we cannot avoid the conversations it has brought into our homes and workplaces, or the need to process the senseless act. But God is still God. We cannot let this moment become our focus. 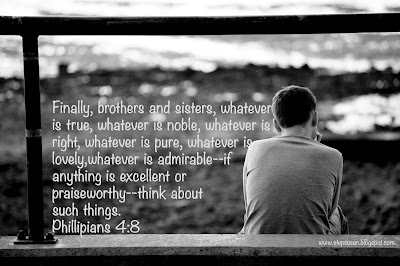 We need to think on good things. Because when we do, we find peace and hope. And I'd much rather focus on that. Amen! Sometimes, well really all times, I have to be conscious about following this verse. It's one of my favorites! Sing it sista! :) Amen is right:) So good to see you, Sheri!! Love that verse. Love it! I'm heart-broken for the victims and their families. So many heroes rose to the occasion though. Police, firemen, EMTs, strangers helping strangers. People in the crowd reached out to others they didn't know. God can bring beauty from ashes. I love this verse. Thanks for sharing.